Somewhere between not publishing official economic data and overseeing a banknote printing frenzy on steroids, Venezuela’s Central Bank (BCV) still finds time for the mundane. According to this tweet from Bloomberg News correspondent Nathan Crooks, our maximum monetary authority just announced an open tender for the procurement of (and I’m not making this up) tuxedos for waiters. As in, penguin suits for black-tie affairs. Interested parties can even attend a scheduled preparatory meeting in case they wish to discuss the finer points of our nations’s resource allocation for men’s evening wear. The notion of prioritizing has reached a new low when the country’s Central Bank shows more concern for cocktail-planning policy than for monetary policy. (In a related story, the BCV will sponsor the production of “Suicide in Spring is Forbidden”, a play about the Spanish Civil War). While the BCV has been too busy to do its job, other folks with more time on their hands have been coming up with alternative instruments to measure economic data like our inflation rate: There’s the “arepa index” created by fellow blogger Miguel Octavio, and my personal favorite, the Indice de Pollo en Brasa, or Roasted Chicken Indicator, which we have Luis Carlos Díaz to thank for. 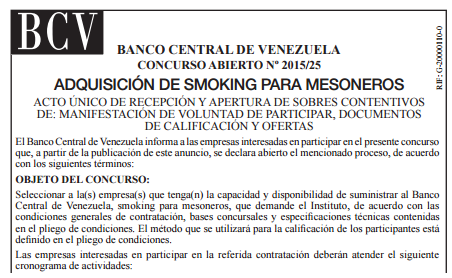 No word yet on when BCV’s Chairman Nelson Merentes will roll out a Central Bank Catering division.